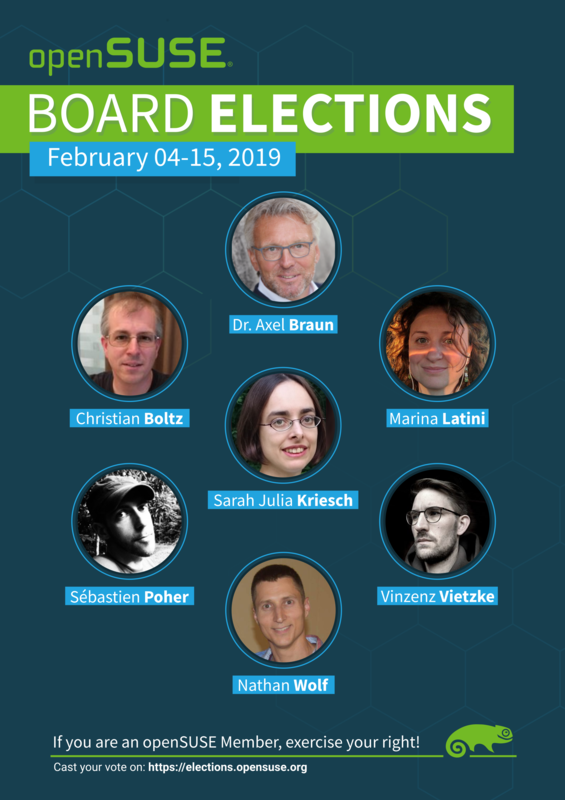 The runners-up in this tough-to-decide race included three other impressive Candidates: Incumbent Sarah Julia Kriesch aka AdaLovelace with 98 votes, Vinzenz Vietzke aka vinzv with 78 votes, Nathan Wolf aka futureboy and CubicleNate with 54 votes, and Sébastien Poher aka sogal with 51 votes. ... And The Race Is On! Start of 5-week phase to apply as a Candidate for a position on the openSUSE Board. Start of 8-week Membership Drive and opportunity to apply for an openSUSE Membership (in order to vote or to run as a candidate). Nominations and Applications for Board Candidacy close. Start of campaign for the candidates before the ballots open (campaigning may continue until ballots close). Membership Drive continues, opportunity to apply for openSUSE Membership, but as of this date it will only decide the eligibility to vote. Ballots open: Please cast your vote during this time. 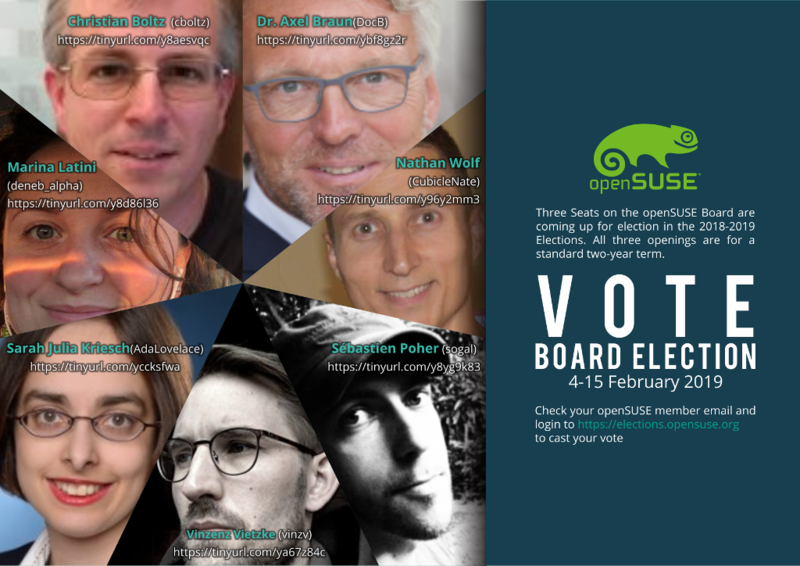 You can contact the committee using the mail address election-officials@opensuse.org. Note: Running as a Candidate in the election means you are making a serious Two Year Commitment to serve on the openSUSE Board and such a commitment is not to be taken lightly. Early resignations from this commitment should only be made for extremely unusual circumstances. It is recommended that prospective Candidates consider this when deciding to run. 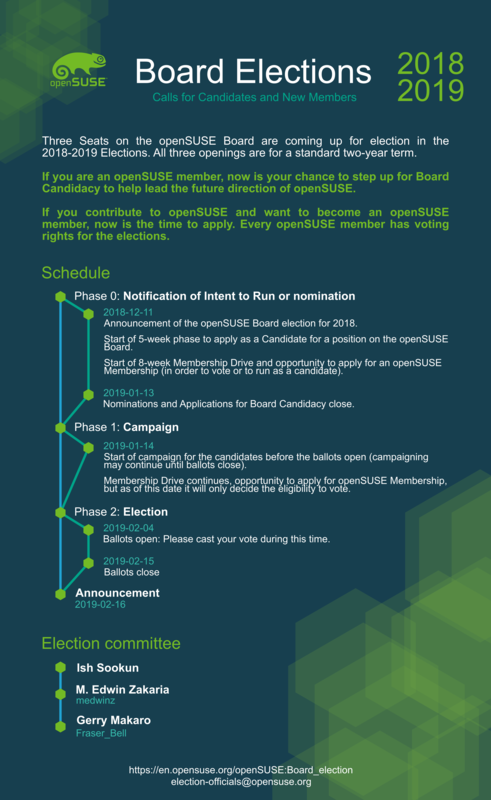 Only openSUSE members are eligible to run for openSUSE Board openings. Election Committee Officials, however, are not eligible to run in order to avoid conflicts of interest. CANCELLED due to lack of Community interest: a moderated Q&A session on IRC, possibly during one of the regular Project meetings or a separate meeting. All persons with voting rights will be able to cast their votes using a link emailed to them mentioning https://elections.opensuse.org. Once a vote has been submitted it, can be changed until the end of the election period. All votes are stored anonymously in the electronic system. This page was last modified on 16 February 2019, at 05:23.